At Torron Group, we are really into doing whatever we can to leave a smaller carbon footprint, so we installed two pollinator gardens -- one in Springfield Commons in Boalsburg and one at our office at 1951 Pine Hall Road in State College. We hope to attract birds, butterflies and other wildlife to make Happy Valley even more beautiful and inviting. If you are interested in starting a pollinator garden. Stay tuned to this blog. We'll post something new every so often Also, please make sure to come by our two locations to see how our gardens progress. Here is one tip to get children involved in the pollinator garden. "Participate in The Great Sunflower Project (www.greatsunflower.org). The Great sunflower Project uses a native annual plant, the sunflower to attract bees. 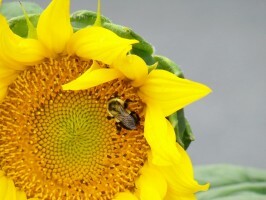 Citizens simply plan sunflower and then twice a month, record the time it takes fives bees to visit a blooming flower. If no bees arrive in 30 minutes, the observation time is finished. They are giving away packets of 'Lemon Queen' sunflower seeds so that everyone can participate." More ideas in the next post.